The conversations we have with our children affect their thinking. Of course they have their own interests, but the conversations we initiate have an impact. Even [when their children are] as young as 22 months, American parents draw boys’ attention to numerical concepts far more often than girls’. Indeed, parents speak to boys about number concepts twice as often as they do girls. For cardinal-numbers speech, in which a number is attached to an obvious noun reference — “Here are five raisins” or “Look at those two beds” — the difference was even larger. Mothers were three times more likely to use such formulations while talking to boys. The researchers note that these differences are not intentional. They were observed in the course of free interactive play between mothers and their children. Greater amounts of early number-related talk may promote familiarity and liking for mathematical concepts, which may influence later preferences and career choices. Additionally, the stereotype of male dominance in math may be so pervasive that culturally prescribed gender roles may be unintentionally reinforced to very young children. So do Tabitha proud, OK? 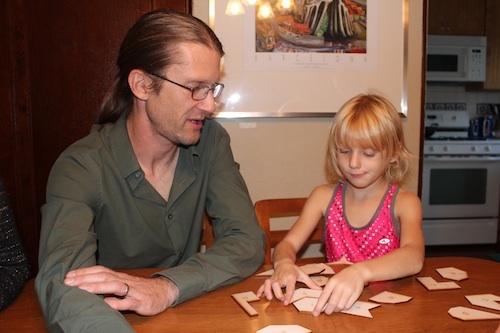 Go ahead and use the two of us as a model for talking math with your daughters. This entry was posted in Research and tagged 1 year old, 2 years old, girls and math. Bookmark the permalink. Reblogged this on Scalliwag Toys. Good writing, and I love it, because I also have a daughter. This is soo soo important- I’m really happy you posted about this. And it’s not just about math, either. There are often gender steryotyping issues when it comes to speech to boys v girls which can hamper development and pigeon hole both genders in roles, emotions, place in society, and career path.